The House on Tuesday passed the final conference version of the Tax Cuts and Jobs Act, which now moves to the Senate for a vote before it goes to President Trump's desk. The final compromised legislation includes reducing the corporate tax rate from 35 to 21 percent, keeping the number of tax brackets at seven but reducing the rates to 0, 10, 12, 22, 24, 32, and 35 percent, and increasing the Child Tax Credit from $1,000 to $2,000 for singles and married couples. The bill also eliminates the Affordable Care Act's individual mandate, which requires that individuals purchase health insurance or pay a penalty to the IRS. Speaker of the House Paul Ryan (R., Wis.) said the bill will give a tax cut of roughly $2,059 for a typical family earning $73,000. "My colleagues, this is a day I have looked forward to for a very long time," said the speaker. "Today, we give the people of this country their money back. The bottom line here is that a typical family making the median family income will get a $2,059 tax cut next year. This is real relief for families out there living paycheck-to-paycheck, struggling to make ends meet." "Here is what it speaks to in what I truly believe is a generational defining moment for this country," he said. "Our tax code is so broken that it undermines the very things that make our nation so exceptional. It punishes hard work and discourages our entrepreneurial spirit. It dims freedom and free enterprise, and limits the potential of our people." "Reform means we go from the back of the pack toward the front. 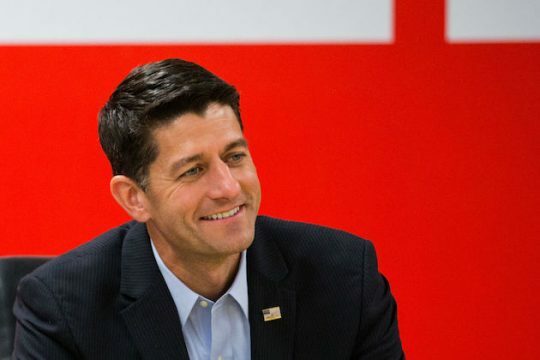 Instead of the slow growth we have been slogging through for years, we go back to real, sustained growth," said Ryan. "We build an opportunity economy where there is more demand for high-wage jobs. This is without question the single most important thing we can do to once again make America the best place to do business."